Sweetheart neckline, stretch knit dress with wide shirred straps. 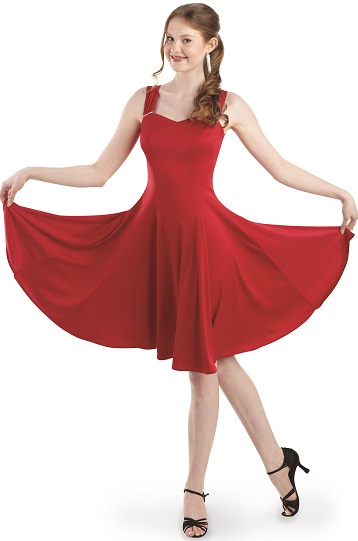 Tank styled dress comes fully lined and the slimming princess seams set off the full skirt. Rhinestones accent the bodice. Hidden back zipper and bra-friendly for modesty. Hemline falls just above the knee. Hand wash cold, drip dry. FWO Extras: Drum majors, if your school allows you to pick out a signature look, try this dress. The knit fabric moves with your body so it will be easy to both ascend your platform and direct the band.